A good selection of cruises out of Tampa go to Roatan Island. Scroll down for the full list of departures. 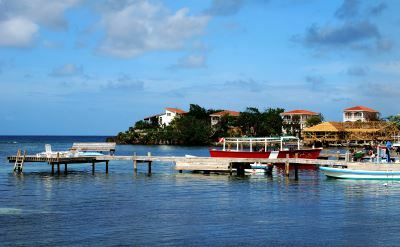 Roatan Island is located off the coast of Honduras and is part of one of the world's largest coral reefs. You'll want to take advantage of the opportunities for diving and snorkeling. Cruise ships dock at two places on the island; either Coxen Hole or Mahogany Bay. Mahogany Bay is a self-contained recreation area with activities and shops. 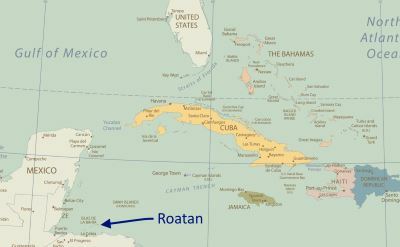 The video is five minutes of exciting adventures around Roatan. All kinds of action sports. Snorkeling and diving are highlights of a stop at Roatan. The water is warm and the reef and fish are spectacular. Sportfishing is also a popular excursion. Marlin, tuna and wahoo fish are plentiful. Other available shore excursions include island tours, ziplines, watching parrots and monkeys at Gumbalina Park, horseback riding, ocean kayaking, or glass-bottom boat rides. 7-night cruise to Roatan on Royal Caribbean. Round-trip from Tampa to Puerto Costa Maya (Mexico), Belize City (Belize), Roatan (Honduras) and Cozumel (Mexico). • 2019 departure: April 20. 7-day cruise to Roatan on Carnival Cruises. Round-trip from Tampa to Cozumel (Mexico), Belize, Isla Roatan (Honduras), and Grand Cayman (Cayman Islands). • 2019 departure: April 21. • 2019 departure: April 28. • 2019 departure: May 5. • 2019 departure: May 12. • 2019 departure: May 19. • 2019 departure: May 26. • 2019 departure: June 2. • 2019 departure: June 9. • 2019 departure: June 16. • 2019 departure: June 23. • 2019 departure: June 30. • 2019 departure: July 7. • 2019 departure: July 14. • 2019 departure: July 21. • 2019 departure: July 28. • 2019 departure: August 4. • 2019 departure: August 11. • 2019 departure: August 18. • 2019 departure: August 25. 7-day cruise to Roatan on Carnival Cruises. Round-trip from Tampa to Cozumel (Mexico), Belize, Isla Roatan (Honduras) and Grand Cayman (Cayman Islands). • 2020 departure: January 5. • 2020 departure: January 11. • 2020 departure: January 12. 6-day cruise to Roatan on Carnival Cruises. Round-trip from Tampa to Isla Roatan (Honduras), Belize and Cozumel (Mexico). • 2020 departure: January 19. • 2020 departure: January 25. 7-day cruise to Roatan on Carnival Cruises. Round-trip from Tampa to Cozumel (Mexico), Costa Maya (Mexico), Isla Roatan (Honduras) and Grand Cayman (Cayman Islands). • 2020 departure: February 2. • 2020 departure: February 8. • 2020 departure: February 9. • 2020 departure: February 16. 7-day cruise to Roatan on Norwegian Cruise Line. Round-trip from Tampa to Costa Maya (Mexico), Harvest Caye (Belize), Roatan (Honduras) and Cozumel (Mexico). • 2020 departure: February 22. • 2020 departure: February 23. • 2020 departure: March 1. • 2020 departure: March 7. • 2020 departure: March 8. • 2020 departure: March 15. • 2020 departure: March 21. • 2020 departure: March 22. • 2020 departure: March 29. • 2020 departure: April 4. • 2020 departure: April 5. • 2020 departure: April 12. • 2020 departure: April 19. • 2020 departure: April 26. 5-day cruise to Roatan on Carnival Cruises. Round-trip from Tampa to Isla Roatan (Honduras) and Cozumel (Mexico). • 2020 departure: May 23. • 2020 departure: July 18. • 2020 departure: August 29. • 2020 departure: October 10. • 2020 departure: November 7. • 2020 departure: November 15. • 2020 departure: November 21. • 2020 departure: November 22. 7-day cruise to Roatan on Norwegian Cruise Line. Round-trip from Tampa to Cozumel (Mexico), Roatan (Honduras), Harvest Caye (Belize) and Costa Maya (Mexico). • 2020 departure: November 29. • 2020 departure: December 5. • 2020 departure: December 13. • 2020 departure: December 20. • 2020 departure: December 27.